Trusting God…Even In The Storm! Those of us who have a tendency to be anxious almost always have one weak spot. Mine has always involved death. Ever since I was a young child, I have spent many hours worrying about death…either my own or that of a family member. As I’ve struggled to overcome my anxiety, it has been necessary to face this fear multiple times. When my twin daughters were 3 years old, my wife began experiencing some unusual symptoms which required her to undergo a battery of tests. I remember thinking repeatedly, “What will I do if she dies?” I couldn’t imagine how I would be able to raise my children alone. Sadly for me at the time, I was so worried that I forgot all about God’s Divine Providence. 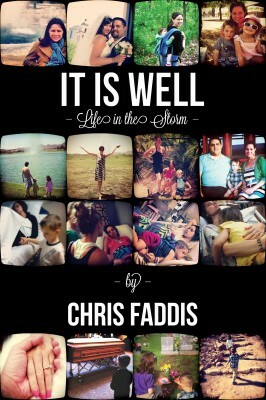 As the saying goes, and what so many of us need to remember is “If God brings you to it, He will bring you through it!” In his new book, It Is Well (Life In The Storm), Chris Faddis offers a powerful testimony reminding us just how true those words really are! In 2011, Chris’ wife Angela was diagnosed with Stage IV colon cancer. At the time, their children were 2 and 4 years old. Over the next 17 months, the family faced the ups and downs associated with a life threatening illness. On September 21, 2012, Angela Faddis died while holding the hand of her husband. On the surface, the story of the Faddis family appears to be a painful tragedy. In reality, however, nothing could be further from the truth. The story of their cancer journey, as told by Chris Faddis, is one of the most UPLIFTING stories that you’ll ever read. Why? Because it illustrates how faith in God can bring you peace and get you through the most difficult situations imaginable. It is a story that we all need to read! God will always be there for you, EVEN in the storm! If you are anxious about the future, this book will provide the perfect antidote. You’ll read a first hand account of what it means to trust God at all times. Through the writing of someone who’s “been there, done that” you will learn that it is possible to face an uncertain future with the Lord by your side. Even if you’re not someone who tends to worry, this book will inspire you. I HIGHLY recommend it! To order the book, visit the IT IS WELL website. Posted in: anxiety, book reviews, trust.